Dr. Manny Calayan and Dra. 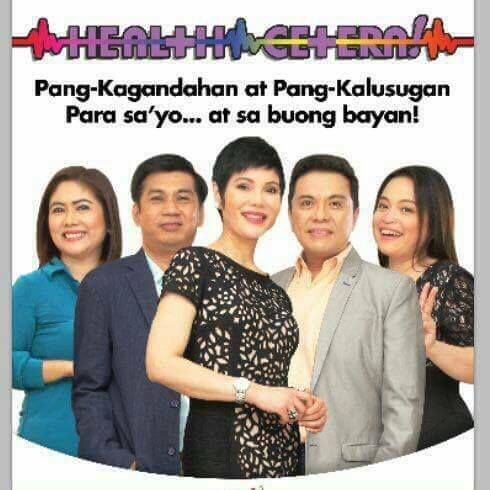 Pie Calayan together with powerhouse experts launch the newest beauty, health and lifestyle magazine show to air every Sunday on GMA NewsTV Channel 11 entitled Healthcetera. Healthcetera is a portmanteau word derived from the words Health and Etcetera. The program aims to provide tips on topics that are very significant to everyone such as beauty, health and wellness. The gamut of health issues, controversial medical topics - inside our bodies, from the head down to our toes, and even the humble weeds, grass, herbs, fruits and vegetables as alternative natural sources for healing and wellness are unraveled in practical, simple terms. Healthcetera gathers a powerhouse cast which makes it more than just a health news show namely Dr. Manny Calayan, Dra. Pie Calayan, Nina Taduran, Marou Sarne and Dr. Sonny Viloria. Doctors Manny and Pie Calayan own and operate Calayan Surgicentre Corporation which is considered as one of the most successful and most recognized surgicentre clinics in the Philippines. Calayan Surgicentre caters top of the line products and services to their patrons that is why they keep on coming back and trust the respected name in the field of dermatology and cosmetic surgery in the country. Nina Taduran is a celebrity broadcaster and a health enthusiast. She hosts the radio program "Wanted Sa Radyo". She won the award “Inspiring Female Host for Public Service” last 2012 and continues to inspire other people on her radio program. Marou Sarne is an award-winning broadcaster and a health advocate. She promotes healthy living on her program and shares tips on topics about health and wellness. Dr. Sonny Viloria is a medical broadcaster and the director of Biovitale Holistic Wellness Center. He completed studies on Natural Therapies and Traditional Chinese Medicine from Australian College of Natural Therapies in Brisbane, Australia. He also attended various seminars related on alternative Health Practices on different countries. Healthcetera is set to kick-off on August 9, 2015, 9am - 9:30am on GMA NewsTV Channel 11. So watch out for Healthcetera and ready yourselves to informative and interesting topics about beauty, health and wellness.